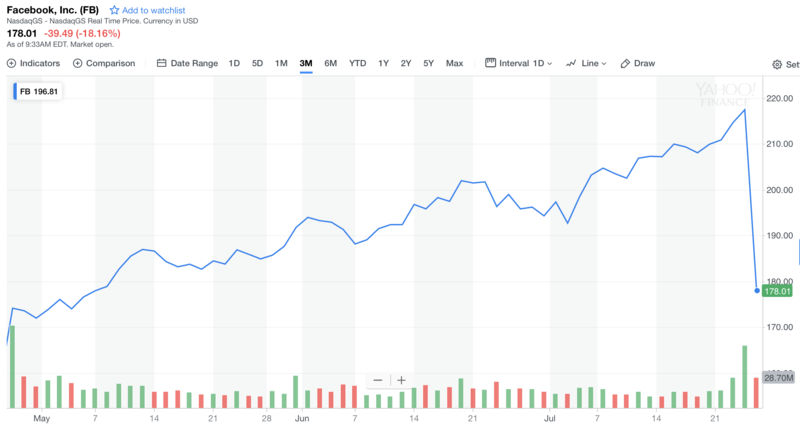 In what could be the biggest one-day drop of all time, Facebook shares opened at $174.89, down 19.6 percent compared to yesterday’s closing price of $217.50 (NASDAQ:FB). When it comes to market capitalization, Facebook was worth $629.6 billion yesterday. The company is now worth $506.2. In other words, Facebook has lost $123.4 billion in value overnight. Today’s performance isn’t due to yet another data misuse or election interfering scandal. The company has reported disappointing earnings. For the first time, Facebook’s growth is stalling. There are barely more people checking Facebook every day compared to previous quarter. Even worse, Facebook’s user base shrank in Europe. Facebook is still growing, but it’s clear that GDPR combined with a saturated market aren’t helping the company. That’s why Facebook is trying to change the narrative. For the first time, the company shared a new “family of apps audience” metric. There are 2.5 billion people using at least one of the company’s app — Facebook, Instagram, Messenger and WhatsApp. It’s clear that Facebook thinks Instagram and ephemeral stories represent the future of the company. But this is going to be a question mark in the coming months as it’s unclear if Instagram can generate as much money as Facebook’s main app. $123,400,000,000 is a big number. It’s hard to grasp how much it represents given the scale of big tech companies. As TechCrunch’s Jon Russell pointed out, bitcoin’s entire market capitalization is currently $141 billion. So it’s like nearly all bitcoins disappeared overnight. Who would have thought Facebook could be more volatile than bitcoin? Even if you compare it to significant tech companies, this is a huge loss. For instance, Netflix is worth $158 billion right now. Twitter’s market cap is only $33 billion. It’s like Facebook shaved off nearly 4 Twitters in market cap overnight. And I’m not even talking about Snap, which is only worth $17 billion. Most people have been focused on Facebook’s losses for now. It’s a staggering event. But it’s now time to look at Facebook’s business model and understand what’s happening. Facebook is an incredible success story. It became a massive business in just a few years. But the company has a dangerous business model. Thousands of employees are looking for ways to collect more data. Business teams can then sell expensive ads because they’re perfectly targeted. And the best way to optimize those efficient ads is by making addictive products. If you spend more time looking at stories, you’re going to be exposed to more ads. That’s why Facebook optimizes for engagement. You get outraged, you become sad, you like and you share. And Facebook makes money. This year is a turning point for Facebook. People will look back at this moment as an inflection point in the company’s trajectory. But it’s still unclear if Facebook has the answer to its structural issues.